Edward Abbey is one of the great environmental writers of the Twentieth Century. Upon his death in 1989, and according to his wishes, he was buried by friends somewhere in the desert. The location was and remains a closely guarded secret. 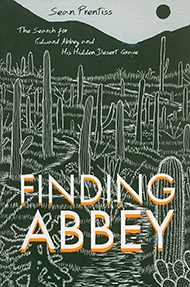 Fast forward twenty years, and Sean Prentiss, an admirer of Abbey’s work, wonders whether it might be possible to find the grave by retracing Abbey’s life from his birthplace in Pennsylvania to the empty spaces of the American southwest. That notion sends him off on a two-year search, the result of which is a brilliant creative treat for us: a seeker’s quest in which we learn about Abbey (the sought after) and Prentiss (the seeker). It’s a warm-hearted and elegantly written work and simply a joy to read. And the grave? Does he find it? That’s the best surprise of all. A masterful portrait of the real Alaska, Kim Heacox’s novel centers around a 95-year old Tlingit native named Old Keb, the last living canoe carver in a small village in Southeast Alaska. His grandson, a promising athlete, sinks into a depression after a disabling accident ends his sports career. In response, Old Keb begins work on what will become his last great canoe and entices the grandson to help. When the canoe is finished, they embark on a voyage to the Tlingit ancestral homeland. It’s a voyage fraught with the hazards of sea as well as an eager government bent on saving them. What makes this story so appealing is the character Old Keb. He is as finely wrought and memorable as any character in contemporary literature and energizes the tale with a humor and warmth that will keep you reading well into the night. In this absorbing story by Jennifer Kingsley, six friends are on a 54-day canoe journey on the Back River of northern Canada. Kingsley captures the interactions between group members as they move northward through the stark beauty of the tundra landscape. There are challenges, of course: difficult whitewater, long portages, days of violent winds, and mosquitoes – swarms and swarms of mosquitoes. But the human challenges are nearly as daunting: how do six people, dependent upon one another and placed in close quarters day after day, get along on such a long journey? That’s where Kingsley’s work really shines, capturing the human dynamics, the give and take, and the concessions each person needs to make to reach the journey’s end. Winner. 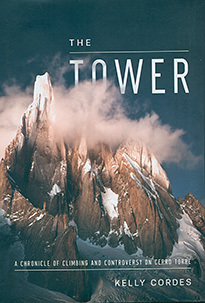 The Tower: A Chronicle of Climbing and Controversy on Cerro Torre. By Kelly Cordes. Patagonia Books, Ventura, CA ISBN 781938340338. Located in the curving tail of South America in Patagonia, Cerro Torre is the iconic mountain of the climbing world. It is a dagger of granite thrusting a mile upward into the sky, pummeled by unimaginable winds: “a shriek turned to stone,” as the great mountaineer Reinhold Messner described it. Author Kelly Cordes has tackled the shriek in two ways: by creating this excellent work of mountaineering history—and by climbing and standing on Cerro Torre’s summit. 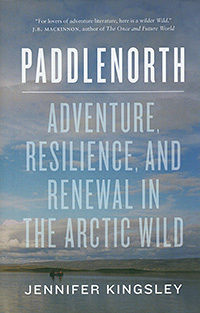 Cordes parlays his intimate understanding of the mountain into a coherent and fascinating narrative. More than just history, The Tower is also fine mountain literature, written with uncommon finesse: a story about a mountain, about those who have endeavored to climb it, and about the secrets hidden in its mists. 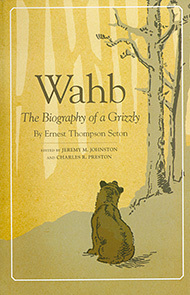 First published in 1900, this is Ernest Thompson Seton’s much loved novella about a silver tipped grizzly named Wahb. The story chronicles Wahb’s life, beginning with the one-year-old’s loss of his mother and siblings, growing into a powerful bear, and finally ending with his death in Yellowstone National Park. Seton was a multifaceted man with diverse interests in the outdoor field. He helped establish the Boy Scouts, and in 1910 authored the first official Scout handbook. He also was a wildlife artist and a serious naturalist, his scientific contributions recognized by the National Academy of Sciences. Although Wahb is a fictional account, Seton took pains to portray the bear's behavior as accurately as it was known in his day. What makes this edition of Seton’s book stand out are over 100 pages of supplementary material by editors Jeremy Johnston and Charles Preston. The story of Wahb is fully annotated with impeccably researched notes describing what is accurate and what is not, based on what we now know of bear behavior. The annotations, alone, are useful and instructive in understanding our changing attitudes toward this remarkable mammal. 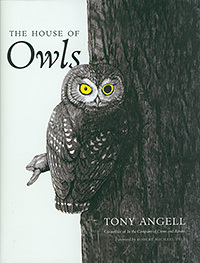 If you’ve thrilled to the haunting, magical sound of an owl on a summer’s evening, you’ll love Tony Angell's captivating book about these charismatic creatures. The House of Owls begins with just that: a bird house in the woods near Angell’s home which is occupied by a pair of Screech Owls. Over the years, more owl pairs come and raise their young, and for the Angell family—and the reader as well—watching them becomes a shared and enchanting experience. As the book’s narrative moves along, Angell traces mankind's fascination with owls in art and writing, and then in a relaxing, readable style, covers all nineteen species of owls found in North America. Angell's beautifully crafted pen and ink drawings add an elegance to the book of which photos could never do justice. All in all, it’s a lovely book, one that would make for a much-appreciated gift, and certainly deserving a prominent position on every owl fancier's bookshelf. Bees have been in the news a lot these days—and for good reason. Populations are plummeting and there’s real concern on how our food supply will be impacted, much of it dependent on bee pollination. 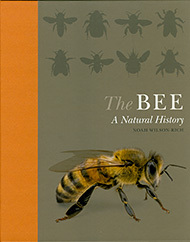 Author Noah Wilson-Rich lays out the irrefutable fact: bees and humans are inescapably interconnected. The bee world is a vast one. Over 20,000 species have been identified, and while no one volume can adequately cover all species, The Bee nimbly summarizes representative members of the nine bee families. There is a little something about all aspects of bees from their biology to their behavior to the profession of bee keeping. It’s all beautifully arranged with a winsome design, instructive illustrations and outstanding photographs. If you have an affinity for birds, you are probably familiar with the story of the Passenger Pigeon and how it had at one time numbered in the billions—and how by the end of the 1800’s had been hunted to extinction. There have been a number of fine works which have covered the Passenger Pigeon in great detail. This book serves a different purpose. Using a combination of text and plentiful illustrative material, it serves as a compressed, yet thoughtful overview of the bird: what it looked like, its habits, the causes of its demise, and its cultural history. 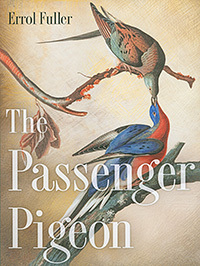 Author Errol Fuller calls the book a “celebration” of the once great presence of the bird, and with historical photographs and paintings found throughout, that’s an apt characterization. In The Human Age we are reminded of the tremendous changes that man has brought to our planet. We have warmed the globe, created new weather patterns, disrupted animal migratory patterns, and accelerated the rate that species are going extinct. 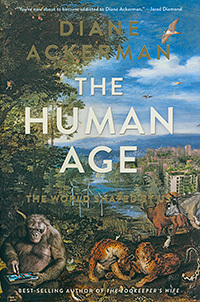 But author Diane Ackerman’s skillfully reasoned message in this book is not doom and gloom. Rather it’s one of guarded optimism. In this far reaching work, she takes us around the world on what she calls a “mental caravan.” While on the caravan, she interviews innovators and scientists, and gives examples throughout the book of what is being done to improve the environment and restore natural systems. We humans are not idle, she writes summing up her core belief. “We are not helpless. We can become Earth-restorers and Earth-guardians. We still have time and talent . . . our mistakes are legion, but our imagination is immeasurable." Not long after she learned of the death of her father, Helen Macdonald, a falconer, undertakes the training of a goshawk, a famously difficult task. 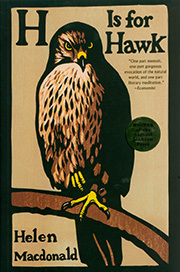 The hawk, as her memoir unfolds, becomes a way for her to cope with the grief that she has carried ever since his death. This is nature writing but with the slant that explores the wildness within as well as without. Giving her work overall structure, Macdonald draws from a book by the British novelist T. H. White who wrote about his own harrowing and largely unsuccessful experiences with training a goshawk. It’s an effective literary technique, bringing Macdonald and White together across the space of time, and producing a compelling meditative work of the connection between animals and humans. This magnificent book will catch your breath. And once your breath returns to normal, and you turn the page, well, your heart will stop. 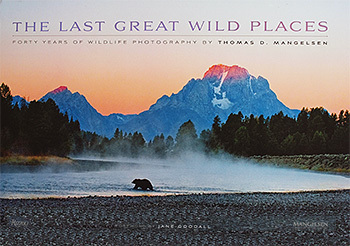 Within the covers of The Last Great Wild Places is the life work of accomplished photographer Thomas D. Mangelsen. It is a work spanning forty years during which he has captured the beauty of the natural world on seven continents. Photography this good deserves special treatment, and the publisher has left no stone unturned in creating a book of the highest quality. The reproductions are exquisite—and the photographs, had they been printed on separate sheets, could have been mounted and hung on a wall. This is as close as it gets to a gallery visit and what better exhibit to take in than the enthralling work of Thomas D. Mangelsen. 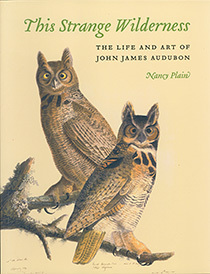 In this marvelous biography for teens, Nancy Plain brings John James Audubon to life. Audubon was a pioneering naturalist, an adventurer in a country with vast regions still unmapped. Life was not easy in the early 1800’s, and he endured business failures and the death of two of his children shortly after their births. Despite these losses, he found solace in the act of painting birds and was drawn again and again into the natural world. Complimenting Plain’s engaging story are paintings by the master himself. Full color reproductions of Audubon’s famous art work are found on almost every other page. From start to finish, this is a fascinating glimpse of a great American naturalist. Winner. Field Guide to Oregon Rivers. By Tim Palmer. Oregon State University Press, Corvallis, OR. ISBN 9780870716270. 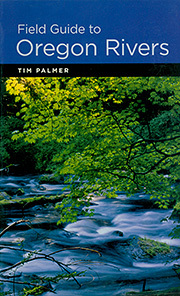 If there is anyone who knows rivers, really knows rivers, it’s Tim Palmer. A practiced naturalist, consummate river explorer and conservationist, Palmer has been writing and photographing rivers for forty years. His expansive knowledge shows in this, his latest work which profiles 120 Oregon rivers. This is more than a paddling guide—it does cover information on river difficulty, put-ins and take-outs—but rivers can also be enjoyed from land, and Palmer includes backroad approaches and hikes along the shoreline. Fishing enthusiasts aren’t left out, and the types of fish found in each of the rivers are listed along with season dates and fishing access points. Throughout the book he reminds us of the importance of rivers, what conservation efforts have protected, and what needs to be protected in the future to maintain a healthy and vibrant outdoor environment. Muir Valley located in the Red River Gorge of Kentucky is a climbing area, a rather popular climbing area at that. In fact, according to Outside Magazine, it is the most popular climbing area in the east. 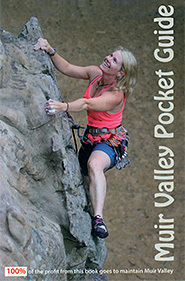 The Muir Valley Pocket Guide (it truly does fit in a pocket) describes each of the area’s 400 climbing routes. For such a small package, it’s exceptionally comprehensive and easy to use. With intelligent graphics and maps, everything you need is at your fingertips. There’s something else that makes this guide special, and it concerns the generosity of two individuals. Muir Valley would not be the climbing mecca that is had it not been for the author, Rick Weber and his wife Liz. In 2004, they purchased the land, and at their own expense managed it as a preserve, freely opening it to climbers. In March of 2015, they gifted the land to Friends of Muir Valley which now manages the area. Proceeds from the guide? You guessed it. It’s that same theme of generosity. It all goes to maintain the area. Marine biologist Kate Wynne and illustrator Garth Mix have teamed up for another winner. 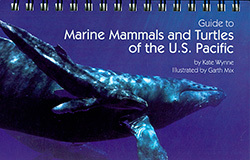 Their guide to sea mammals of the Atlantic Ocean won a National Outdoor Book Award several years ago, and they have done it again with this new guide to the Pacific Ocean. It has all the elements that make a good guidebook. Among those are durable coated pages with a wire binding at the top which makes it easy to flip open—and stay open—for use on boats and beach walks. Each species is represented by color photographs and a scientifically accurate color illustration. Range maps show where each species occurs and surface profile silhouettes aid in making a positive identification. Textual materials include the behavior of each species, dive patterns, habitat, life history, and interactions with humans. Compact, easy-to-use (and, yes, waterproof! ), sea life guidebooks don’t get any better than this. 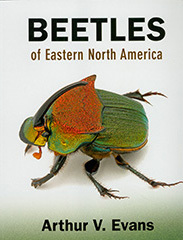 This is a beetle lovers’ delight: the most comprehensive, full-color guide to the beetles east of the Mississippi River. It covers a whopping 1,406 species in 115 families, illustrated by over 1,500 color photographs. Organized by family, the book includes an illustrated key which aids in identifying the most common beetle families. Arthur Evans’ text is scientifically precise, but clear and understandable, making it useful for amateurs and professionals alike. 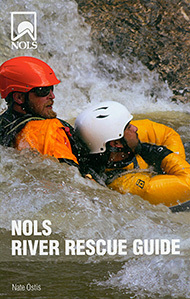 The acronym “NOLS” in the title NOLS River Rescue Guide refers to the National Outdoor Leadership School which has been running river trips for much of the last half century. Colorfully illustrated throughout, the Guide is a compendium of well-tested procedures and techniques that have been found to be practical and useful in their river program. Written by long time river runner and NOLS senior instructor Nate Ostis, it is a welcome addition to river safety literature. Editor, writer and wildlife educator. Creator and author of Duck Duck Moose, a blog about nature and family. Former Assistant Book Review Editor for ISLE: Interdisciplinary Studies in Literature and Environment. Former writer for Reno News & Review. Master of Arts in Literature and Environment. Freelance outdoor writer/photographer/editor and certified Nordic ski instructor. Active member of the Outdoor Writers Association of America and the Northwest Outdoor Writers Association. Doctorate in Recreation and Leisure Services from University of Utah. Author of Best Easy Day Hikes Boise and Best Rail Trails Pacific Northwest: Washington, Oregon, and Idaho and Boise's Best Outdoor Adventures mobile app travel guide. Head Librarian, Summit Country Library, Kama Branch. Former Lead Wilderness Ranger for the US Forest Service (5 years). Level III ski patroller and former president of the Canyons Professional Ski Patrol Association. Reviewer for “Women Writing in the West” Book Awards. Former Dean and Professor Emeritus of Environmental Studies, Huxley College, Western Washington University. 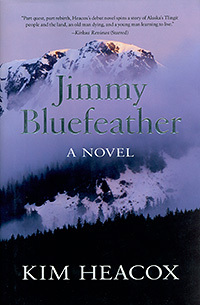 Author of six books, most recently Wilderness in National Parks: Playground or Preserve. Currently researching books on national parks and the history of the youth conservation movement. Publisher of Purple House Press specializing in classic children's books. Supervises book layout, design and production. Lives on an old dairy farm with her husband, three children, and an assortment of dogs and cats. Past president of the local Humane Society. Assistant Professor, Department of Parks, Recreation, and Tourism Management at North Carolina State University. Formerly, program director and instructor at Penn State University working with recreation majors and overseeing Penn State's Wilderness Orientation Program. Past program director with Clemson University's Clemson Expeditions. Masters of Education in Outdoor Education. Outdoor industry attorney, risk management consultant, author and speaker. Chair, American Alpine Club Library Committee. Board of directors of the Galapagos Preservation Society, and Colorado Alliance of Environmental Education. Teaches ski area risk assessment, liability and safety at Colorado Mountain College. Author of Outdoor Recreation Risk Management, Insurance and Law. Founder and Director of the California Ski Library. Author of works on the history of skiing (Lost Ski Areas, Pray for Snow: The History of Skiing in Southern California, etc.). Professor of Kinesiology at Moreno Valley College.